It has been more than 20 years, I was just about 7 or 8. 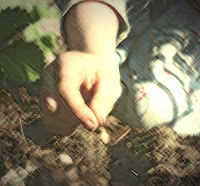 I planted a pumpkin seed during one of our summer vacation visit to our village. I planted the seed at the back side of our village home and to have as witness of such a special work; I had my grand mother. She directed me how to dig a hole, put the seed inside it and put water around it. For next 7 days stay, I kept on going to that spot to see the plant grow and bear a big pumpkin. Why I sown a pumpkin seed? Because then, as a child I loved the way pumpkin looked. Huge round shape with grooves, resembling a big globe, that once I had seen in the principal's room in our school. How silly the reason is, but I was obsesses to own one such pumpkin. There was no other good option than owning a pumpkin that bore in the plant that you have yourself-planted. After 4 months of time, another vacation came, it was Durga puja vacation, and we went back to village, all the way I was dreaming of the pumpkin plant. I knew, in these 4 months of time, my Grandma must have taken good care of the pumpkin plant. I forgot to tell another reason why, I liked the Pumpkin plant. It is because of my grandmother's "Bhudi Asuruni Story" (The Old Witch Story) in which pumpkin plant played a greater role in becoming the connecting link between the earth and the heaven. As we reached our village, I rushed to the place where I had sown the Pumpkin seed. Oh! there It was so green so tender, it curled around two bamboo twig, which off course grandma have poled to give the plant its 1st support to climb up. From the stem I followed the plant through my eyes till the apex. It was indeed making its way to the heaven. As I was observing the plant, my grandma became very happy, to see me happy. She was glad that, I liked the way she had taken good care of the Pumpkin plant. The vacation was short so I could not witness much of the plant's growth. Back in Bhubaneswar, I boasted about the Pumpkin Plant to all my friends even I said to my class teacher that some day I am going to be the proud owner of a pumpkin. She said, "Oh! is it?" and the whole class laughed. That year's winter, our school was about close for winter vacation, we got a call from village that Grandma is unwell. We all rushed to see her, she was in the bed coughing heavily. She became so pale. When she saw me her eyes became bright. Three days earlier, it was too stormy, grandma in order to protect the pumpkin plant, from being getting affected by the winds and rain, she covered the plant with the palm leaf Pakhiya, in-spite of getting wet in the rain herself. Grandma became well, in following couple of days, and we were back to work again. Thanks, Grandma, the plant was around the top of hut, spreading its wide large hairy leaves. Even it bore yellow thick flowers and small little pumpkins. I was excited that I am not going to own only one but many pumpkins. It really bore many pumpkins. All were eaten, distributed to relatives, but one was kept, by my grandma, the most ripen one. She dried it under sun and made a Thala out of it. Grandma died peacefully when, I was graduating college in 2003, and I still proudly owns the Pumpkin Thala, that treasures the memories of my Grandma. Our mind is indeed an innocent masterpiece created by God. But as we age, dust and mud of negativity and ill-thoughts destroy this masterpiece. Human relationships are the best creations on Earth.They not only support us but also act as the flames of hope, faith and true love....Your story imbibe these great qualities and gifts of man. We should all cherish these wonderful blessings in our lives and do our best to nourish them.